Meat, potatoes and carrots form the base of the pot roast. 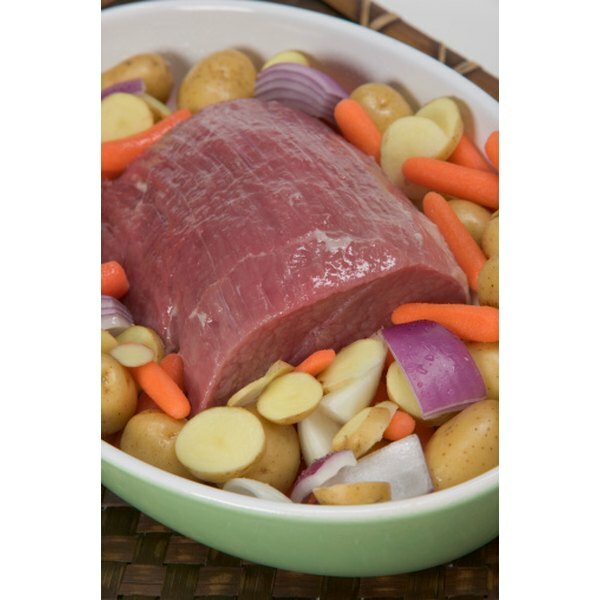 Pot roasts can contain a variety of ingredients and seasonings, but most recipes are built around a base of chuck roast, roasted carrots and potatoes. Though the traditional pot roast may not be the healthiest choice for dinner -- it will have about 8 g of saturated fat -- it is a complete meal by itself. With the right instructions, yours will turn out juicy and flavorful. Brown the roast on all sides. Pour enough oil in a large Dutch oven to cover the bottom of the pan and apply medium-high heat. Sprinkle the pot roast with salt and pepper and add the roast to the pan. Turn the roast every couple minutes until it is brown on all sides (about 8 to 10 minutes). Once browned, remove the pot roast from the pan. Reduce the heat to medium, add the onion to the pan where the pot roast was searing and saute until slightly browned (add additional oil if needed). When the onions are almost done, stir in the flour. Add the carrots to the pot with the onions and place the pot roast on top of the vegetables. Pour beef stock and Worcestershire sauce over the roast, and heat on the stove top until it simmers. Place the cover over the Dutch oven and slow-cook the pot roast in the oven for about 1 1/2 hours. 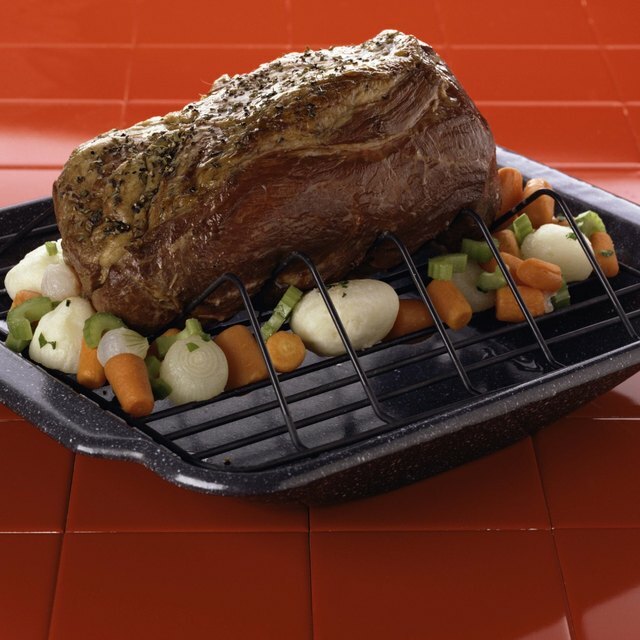 Take the roast out of the oven and remove it from the pan. Add the potatoes, turn the roast over and place it on top of the vegetables. Cover and continue to slow-cook the pot roast for an additional 1 1/2 to 2 hours or until the meat is cooked through and the vegetables are tender. If after it's done the sauce isn't thick enough, remove the roast and add a flour-and-water mixture (about 3 tbsp. of flour mixed with 3/4 cup of water) to the pan and cook it on the stove top until you get the desired thickness. You can also add sliced mushrooms to this dish -- just add them in at the time you're cooking the onions. Check out my other articles on HubPages! !